The Robox Energy Screw Blower WS85 from Gardner Denver. Gardner Denver is launching its new OneAir vacuum and pressure offer for the first time at IFAT 2018, which is taking place in Munich this week. The company will demonstrate its portfolio of intelligent technology solutions to help the water and wastewater industry meet its Water 4.0 targets. 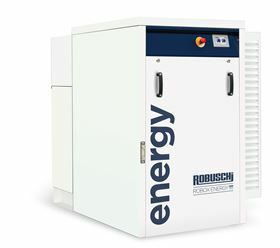 Gardner Denver will showcase new models from the Robuschi range of blower technologies, including the official launch of the Robox Energy screw blower and the re-designed Robox Lobe blower package. The Robox Energy IMPACT 4.0 screw blower incorporates a permanent magnet motor fitted directly to the conductor shaft, with a wear-free design, preventing any potential loss of power from the belt drive. It has a plug and play design and integral cooling on the electric cabinet allowing fast installation and safe operation, even in high ambient temperatures. Robox Energy works with iConn, Gardner Denver’s management system. iConn provides plant operators with real-time data to help them meet the requirements for Water 4.0 automation. Also new at IFAT 2018 is the re-designed Robox rotary lobe blower package, with a high-performance cooling fan, for improved air circulation and both inlet and discharge silencers and an acoustic hood to address noise levels. The NASH Vectra SX is a new range of small capacity liquid ring vacuum pumps and compressors.